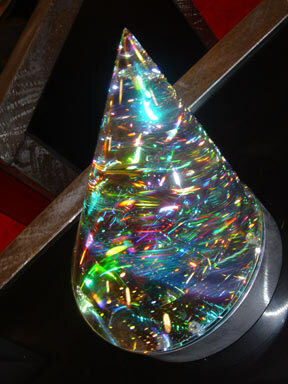 This sculpture is composed of seven layers of glass, four layers of 3/4" starfire, and 3 layers of thin Dichroic. The top point of the piece is off center and creates a whirlpool or spiral effect when looking at the sculpture. The colors are stunning. Approx. 5" wide at bottom, and a little more than 3" tall. 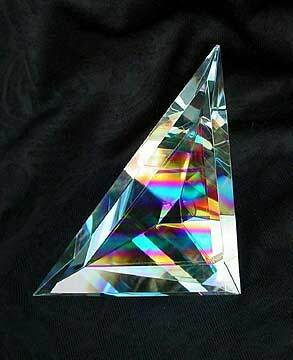 This piece is very similar to what I teach in the Faceted Dichroic Glass Sculpture Class. It's made from two layers of 3/4" starfire glass, and a thin layer of CBS dichroic glass laminated in between. Approx. 3 1/2" X 3 1/2" X 5 1/2 and is a little over 1 1/2 inches thick. Private collection. This is the largest sculpture I've done in this series to date. 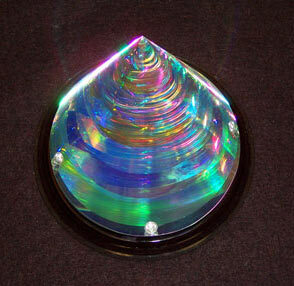 It's made from 11 layers of glass, six layers of 3/4" starfire, and five layers of thin Dichroic glass by CBS. This piece had a wonderful unintended consequence, the colors that you see are not the colors I had cut out of the dichroic glass sheets, but rather created from light bouncing back and forth inside the piece, rather mixing light instead of paint. Measures approx. seven inches in diameter at bottom and ten inches along the slope. This sculpture won two awards in 2006, 1st place popular vote at Glass Craft and Bead Expo in Las Vegas, and 1st place at Coatings by Sandberg dichroic glass art contest in Orange, CA. My favorite sculpture so far, you can look at it for hours. Every fractional movement of your head and the colors change. Private collection.